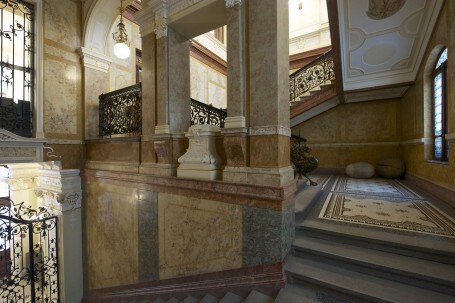 Prague, 18 January, 2016 – Flow East, the Anglo-Czech property developer and heritage campaigner, has announced that it will host a design competition for the missing statue on the “Císařské schodiště” (imperial staircase) of The Forum building at Wenceslas Square 19. Since acquiring the Neo-Baroque structure in 2002, Flow East has found no archival evidence of the lost or destroyed statue that once sat atop the empty pedestal adorning the Baroque stucco imperial staircase, the building’s dominant interior feature. “Given that we have no likeness off of which to base a replacement statue, we are turning to the public and our local designers, that they might take interest in contributing to the restoration of a truly magnificent piece of architecture,” said James Woolf, CEO of Flow East. Dating back to 1896 and renovated by Flow East in 2005, The Forum is one of the largest historical buildings on Prague’s Wenceslas Square and is listed as a cultural landmark, owing in part to its original occupant, Assicurazioni Generali insurance company, where Franz Kafka was briefly employed. The Forum comprises of six floors and offers Class A office and retail space in the very heart of Prague. The winning designer will be awarded CZK 100,000 in addition to the complete coverage of all costs connected to the construction of the statue. Interested artists may submit their designs to soutezVN@floweast.com by 31 March 2016. The winner will be chosen by a panel of Flow East members by the end of April 2016. Flow East focuses primarily on investments into and the restoration of historical buildings in exclusive locations across Europe, especially in Prague’s city centre. From Medieval, to Renaissance, to Neo-Baroque, Flow East stringently maintains a stylistically diverse portfolio of exceptional properties, many of which are listed as cultural real estate landmarks and heritage sites.